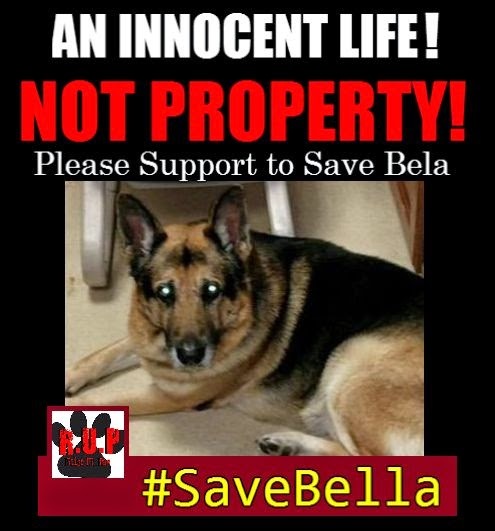 RAISE UR PAW NEWS: THE CASE OF BELA --- A Companion Is Not Property! THE CASE OF BELA IS ONE THAT I AM SURE THAT MANY HAVE READ ABOUT - IF NOT, HERE IS THE ARTICLE -- http://www.inquisitr.com/1686720/bela-german-shepherds-owners-will-says-healthy-dog-be-euthanized-and-its-ashes-be-mixed-with-her-own/ AND HERE IS A STATEMENT THAT WE WISH TO SHARE OF OUR OWN ABOUT THIS ISSUE. We at RAISE UR PAW, a not-for-profit incorporation, are continuously fighting for the rights/welfare of animals and when we first laid eyes upon the story of "Bela" we simply couldn't ignore the situation. We understand that as pet owners, we all want what is best for our companion animals if by chance anything was to happen to us - as we would for our own children, such as who would take care of our beloved furry family members? would our companions be taken care of properly and lovingly if in the even of our passing etc.? These and other questions, I am sure that many of us have thought of --- However, when it comes to the final decision, would we put it in our wills to have our pets euthanized, in the event of our passing- so that we could be buried together? This is exactly the situation is in "Bela's" case and it has not only raised eyebrows of many, but some negativity and outrage as well. The more I read the article the more disturbed I was, and the disturbance of this matter didn't really turn to extreme outrage until I read the part where the owner's lawyer stated that the German Shepherd is his client's "property" and she was free to do with him as she wished. That right there was the straw that broke the camel's back with me - I understand that even without that statement I would still fight to help "Bela" but with just that remark was enough to really send me forward, not only to save the life of this innocent being, but to show the world that an animal is not/nor should ever be considered "Property". This lawyer's statement is not only disgraceful in my opinion, but also totally unacceptable and I believe that if this is indeed the law, and that this is how law sees companion animals, then there is some real changes that need to be made immediately.. for this will stir up more problems and issues, especially with animal abusers/killers by using this as a loophole to get away with their crimes against nature. I am hoping that with Bela's case and story more individuals will come together united to save this beloved animal from a fate that was legally signed & sealed - and to also raise our paws and voices against companion animals being considered "property" - for they are living, breathing beings and to some "our children" and should not be permitted to be labelled in this way. Please Support and Take part in the efforts to Save "Bela" - We are his voice, and it is time for his voice to be heard.